Mustang Limited Edition Pinball Machine - The new Ford Mustang Pinball Machines from Stern feature cabinet and backboard artwork paying tribute to 50 years of Ford Mustang history. The Mustang Pinball Limited Edition Model will be signed by the designers and features the original 1965 Mustang and the all-new 2015 Model, as well as Genuine Chrome Mustang Speaker Grille Badges ! Mustang Pinball Machines features the voice of famous race driver and television host Tanner Foust, and comes with five decades of music to select from, by artists like Motorhead, Jan & Dean, The Romantics and many more ! 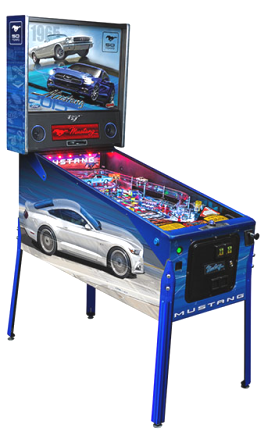 Mustang Pinball Machines will incorporate a mix of classic pinball features with modern technology to allow players to “go racing” with some the greatest Mustangs of all time, and players experience the thrill of building an amazing dream collection of the most desirable Mustangs including GT's, Mach 1's, Cobras, Boss Mustangs and the 2015 Mustang as they progress in the game. There are different interactive sections in the playfield, and hitting specific targets enables gear shifting, and subsequent hits activate shifting of gears up or down. Game features a new video display in the backboard and real Mustang sounds, giving players the visceral experience of driving a Ford Mustang ! Players ace against an array of colorful game characters in (8) different racing scenarios including drifting, drag racing, road races, rallies and police pursuits. Take down the "Shift" Drop Targets to shift your way up thru the gears into "Gears" Multiball. Shoot around the playfield to earn Ford Racing parts and customize, modify and tune your Mustangs ! Advance thru the challenge ladder in order to race in the Silverball Stampede; an all-out coast to coast run against all of the wacky opponents in the game.